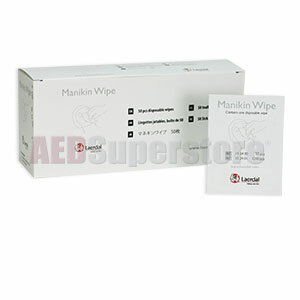 Ideal for use in cleaning and disinfecting Manikins between students. Unfolded wipe is approx 5 1/2" x 7 1/2" and soaked in 70% ethyl alcohol. Available in a single box of 50 wipes or 24 boxes for a total of 1200 wipes. Use the dropdown window above to select desired quantity. Very moist wipes. Does a great job cleaning the manikins after use, and getting them ready for the next class. Will definitely buy again.